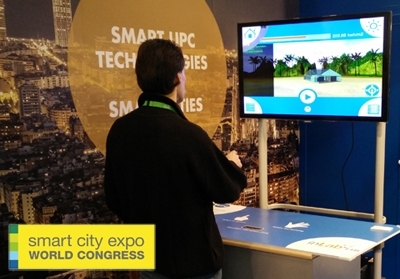 Today, 18 November, has opened a new edition of the Smart City Expo World Congress conference on sustainability issues and model efficiency/optimization of resources in the management of smart cities. This year we have been invited as a member of the CIT UPC, we have an stand in Gran Via Fira 2 Barcelona, where we present an example of how the energy efficiency of a home can be calculated from intensive technical co-simulation, with the selection of different building materials, architectural solution used, orientation and weather among other factors. 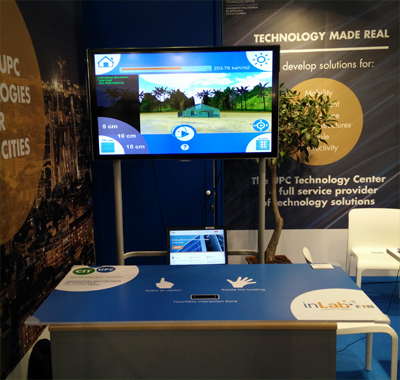 At our stand (F617, Hall 2) you can see the simulation results obtained from the configuration of the building that the user selects by wireless environment interaction, Leap Motion, tool developed to inLab. UPC leads more than 120 research and innovation projects related to smart city, new city model that integrates initiatives aimed at improving the quality of people's life and responds to new challenges in areas of the city as infrastructure management, health, energy, urban mobility, environmental sustainability and intensively using Information and Communications Technology. Professor Jaume Barcelo moderate a session or mobility, called ITS (Intelligent Transportation Systems) for urban mobility in which will talk about the package distribution in a smart city.